Forget Winter, the Biggest Small Thing in Sleep Medicine is Coming! I may be getting ahead of myself by posing the question about compliance considering this project is still in its funding phase but for the sake of keeping this topic trending let’s kick the tires on this CPAP…. or mask…. or whatever new classification it will create. So what is the Airing? 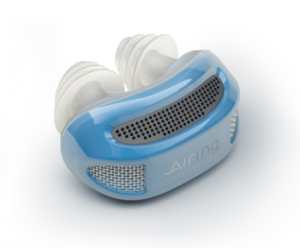 In case you have not heard of the Airing it is advertised to be the first cordless, hose-less, and mask-less micro CPAP device (device being the key word since it’s not a mask or a machine but somehow it’s both). There are no straps, hoses or cords and the device resembles a beefed up nasal pillow cushion. The device inserts into the nostrils and encloses a battery operated blower system that weighs less than an ounce. Almost sounds too good to be true, right? This week a few of our staff will be attending the APSS (annual sleep conference) in Seattle, WA and my pre-trip meeting with them included obtaining as much feedback about the Airing as possible. My inbox and FaceBook page has been blowing up with all my friends forwarding articles on this inventive project and it has created quite a buzz within the sleep industry from technicians, physicians and manufacturers alike. I haven’t seen this much excitement since Home Sleep Testing was approved by Medicare. Weighs less than an ounce! The industry of sleep medicine can be a very territorial area where many manufacturers have tried to gain market share with their product only to meet resistance by the gate keepers. I have to admit myself that when I read about this product I thought it was some sort of satire article because of many different obstacles I could see it running in to. I would like to point out the specific areas as a seasoned RPSGT (registered polysomnographic sleep technologist) and provider of CPAP (continuous positive airway pressure) devices where I am skeptical about this device as well as give it a fair chance where it can be a positive product for the market. The Pros of this Device as I See Them. Compliance: With a national average that hovers around the 50% mark, meaning only half of the people prescribed CPAP actually use it effectively, the market needs a product that “rescues” users that want to use CPAP but are non tolerable to traditional positive airway pressure devices. Apnea sufferers that are diagnosed with a mild case 5 to 15 events per hour , people that have hypopnea syndrome(partial airway closure), UARS (upper airway resistance syndrome) and chronic snorers are the most difficult to maintain compliance or long term use. With that being said, a product that is this non invasive and meets a certain amount of minimal needs such as 4cm/H2O to 8cm/H2O or so this just may be the ticket to therapy use. Travel: Whether you’re camping or catching some Zzzs on a long flight this device may be a suitable option to use and allows you to leave all of your other gear on your nightstand at home. This is much easier to pack than to lug around a travel case with all the standard accessories that accompany CPAP. Cost: This product is being touted as something that will be much less expensive than a standard blower which is good news since most people that use it may be those that are self pay, at least until insurance companies come up with reimbursement codes for the product. It also goes without saying that since the mask and machine are one in the same that you will not need to buy both as you would with a traditional system. Freedom: Cordless, hoseless, and maskless. No other explanation needed, right? Reputation: Everyone seems to know someone that uses one of those C-PACK breathing machines (sorry, old sleep tech joke)? Anyways, just one glance at someone on a traditional set up and people say they look like they are about to go on an exploratory mission to Mars or depths of the ocean. We all hear the same story in the sleep lab from patients “You expect me to sleep with all of that?” The Airing might just be the product that gets more people to accept and embrace therapy. Full Face Needs: Though full face masks are invasive and the Airing is marketed as the exact opposite, many sleep apnea suffers that require a full face mask to meet the needs of high pressure settings , people with deviated septum, bi-level users, and general mouth breathers most likely will not benefit from this device. Therapy Modes: Maybe this is something that is being addressed but I have not heard of any other therapy modes outside of standard CPAP mode (fixed pressure settings). There is a need for Auto CPAP (APAP) and Bi-Level (BiPAP) therapy modes to be available to many users that fall into particular treatment categories. User comfort features to exhale against pressure should be addressed such as EPR offered by ResMed and FLEX offered by Philips Respironics. Though these exhalation comfort settings are not required for better therapy outcomes they do offer a placebo effect to some new users trying to adjust to PAP therapy. Humidification: I guess if you have a home humidification unit this may not be too bad but I have seen where a CPAP heated humidifier greatly benefits users, especially those that need pressures greater than 8cm/H2O. Fisher and Paykel released a study that shows with proper humidification a user may need less pressure to stabilize the airway and we all know less pressure needed is a good thing. If you live in a part of the country where the air is very dry this could be a major issue for you. Insurance Reimbursement: I’m sure a code will come out for this product eventually and insurance companies may like the fact there will be less to bill but the question is what do you bill it under? And let us not forget about the all important data downloads that insurance companies insist to see compliance, hopefully this is a feature that is in the works. No, Really. It’s that small! In conclusion I would like to say the jury is still out on this product, heck we haven’t seen any of the evidence yet but we are excited to see what it can do if it is given a fair shake in the market place. The big question will be if any physicians are willing to support this and provide a prescription. I believe it will be a good thing for people that need therapy but are not willing to use traditional PAP devices however my concerns are the people that need other therapy modes or higher settings but are not properly educated if this device will be effective in their long term sleep health. Check back with us for more information about this product and we are anxious to hear from the creators of this device and its journey to the marketplace.